PDF Creator is a free application that allows you to easily creates PDFs from any Windows program that is able to print. With PDFCreator you can create PDF's, Postscript and Encapsulated Postscript files, create images from your documents, combine documents and much more. Use PDF Creator like a printer in Word, StarCalc or any other Windows application that that allows you to print its document. Using PDF Creator you can encrypt PDFs and protect them from being opened and send generated files safely via email. 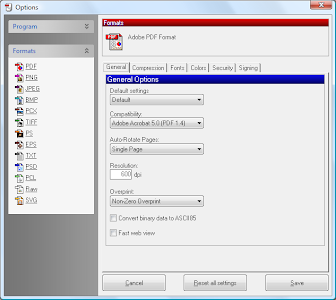 PDF Creator creates more than just PDFs, it can create PNG, JPG, TIFF, BMP, PCX, PS, EPS files. PDF Creator makes it possible to digitally sign your PDFs to ensure that you are the author and the file has not been modified. Create documents in the following formats: Portable Document Format (PDF, PDF/A, PDF/X), PNG, JPEG, BMP, PCX, TIFF, Postscript (PS), Encapsulated Postscript (EPS), Text, Adobe Photoshop (PSD), PCL, RAW and SVG (experimental).